Has anybody tried the new, optional, morale system yet? I started a new campaign and the first mission is a Section M doing a nighttime (i.e. night rules) landing on the enemy coast. Instead of the expected german patrol, they are betrayed by the crew of the ship that brought them ashore. And soon things go even more wrong as dark, slick shapes rise from the waves to attack the force. Deep ones and their human cronies attack the Section M force (Badgers commandoes escorting M agents to the shore). As I am starting a whole new campaign, I decided to incorporate the optional morale rules to the game. Since I made that desicion on the fly, I didn't really prepare for them propely while building the forces. I only now, that the game is underway, appreciate the role of the gold-bordered command units. You really have to pay more attention to the placement of the commanders on the battlefield to stop the morale from crumbling. The Section M forces were more fortunate as I happened to have selected good many command units for them and they have been spread out nice and even. The deep ones side has a bit problem with less amount of command units on the field. The map has actually four objectives scattered around: Small house on an island, Lighthouse in the cliffs, larger house farther away from the rest also on cliffside and the ship, Ventura. Seb, the smuggler and the old lighthouse keeper (both Deep One agents) are holding the lighthouse with Ariane and four Section M specialists outside trying to get in. It all looked bit fine for the two Deep One agents because the lighthouse is very secure place to defend. Seb on downstairs with MP40 and the lighthouse keeper upstairs with a shotgun. That was quite fine to keep the Section M at bay. Until the M sniper specialist started to fire. Two shots from the sniper rifle not only wounded the lighthouse keeper in the second floor, but also first made him SHAKEN with the first shot and then ROUTED on the second shot. And no officers in sight, he is pretty much out of the game now, quivering on the floor, refusing to fight! So far, the rest of the fight has gone without the morale rules giving too much trouble for the combatants as the rest of the map is pretty well covered by officers keeping people in line. I haven't finished the game yet, but I can see already that the new morale rules will have a big impact on how the battles will be fought and I need to take that into account. The new sergeants from the gazette will become very valuable addition to the forces as the importance of the officers has gone up. One thing I decided to house rule on the spot: when casting a spell the sorcerer will get suppression markers. Those suppression markers would make the sorcerer then take SHAKEN marker (and then ROUTED marker). That would make the magic users very ineffective (or needing some officer to hang with him all the time). So, as a house rule, I decided that when casting a spell, the suppression markers won't give the caster SHAKEN/ROUTED markers. Only shooting/assaults will give those. Other than that, I'm looking forward on using the new morale rules on my new campaign. Cool write-up! I haven't tried it yet but I really like the ideas of this Gazette. It make games feel more realistic and suppressive fire becomes even more important. Pounding continuously with the .30 cal and its Machine Gunner and Suppressive Fire abilities is so much fun! You should try the morale rules. They do not add that much on top of the rules, but the effect is really powerful! Yes! This has always been one of my minor thematic shortcomings of the Heroes System: the fact that Officers are easy targets, hence keeping them in the back. With the Morale System officers act like they should, aka 'Lead by Example' and inspiring the troops! The Venture crew were really hard buch, clearing the Venture from the Badgers Commandos (with the help of a few Deep Ones) and killing a bunch of them. The two riflemen were dead accurate with each shot they made! And the First mate, armed with just a knife, charged inside a building and killed Section M agent Axel! The Island house fell to the Deep One side. The Shrimp Monster and a bunch of Deep Ones were killed alongside many of the Commandos on the deck of the Ventura and the beach near it. Meanwhile, in the Lighthouse, the Section M agents managed to charge in and kill Seb the Smuggler after he was wounded and SHAKEN By a snipers bullet. The Lighthouse keeper remained ROUTED and was captured. The game ended with a stalemate (Deep Ones having captured the Ventura and Island house but Section M having captured the Cliff house and Lighthouse. There was a short truce and prisoners were exhanged (Lighthouse Keeper was returned to the Deep Ones in exhange of Badger lieutenant Eisner, who was captured in the Ventura fight) and both sides retreated into the night. Next game: the rest of the Commando force will arrive on the shore and have to face a Shoggoth! Anyway, on topic, I found the new morale system easy to use on top of the existing morale rules. It didn't really take much more time to determine when units are SHAKEN or ROUTED. The Lighthouse battle showed me that troops became very ineffective when they are SHAKEN/ROUTED even if they hold a good position (inside a house or bunker). So if there is no officer nearby, the troops will not recover on their own. This is a powerful effect if there is a HMG inside a bunker and you manage to suppress it. It then becomes SHAKEN and won't be able to fire anymore. So, a sole HMG unit inside a house or bunker will be reduced to ineffective if there is no officers around. Makes those lone hard points easier to deal with. I need to test the new morale rules on a D-DAY beach landing scenario (And I will as there will be several landing scenarios coming up in my campaign soon). Cool report and good points about bunkers without nearby officers. Sounds like the morale system enriches gameplay in a cool and thematic way. I mainly play solo. I.e. playing the both sides to my best ability. I'm actually testing a new way to solo this. I take the order blocks + 1 Bluff block as normal, then mix them without seeing the order number. I then put the blocks (number side down) on the troops I want to activate and then play the cards that are played during the order phase. (i.e. if I need to remove an order because of a card, I don't know what order number it is or even if it is the bluff order). After that, I turn over all orders and reveal the numbers. Now, whoever has the Bluff order, has an option to exhange it with another order or keep the Bluff. After that, the Bluff functions as a no orders. This makes the Bluff token worth something and makes buying a second Bluff order worth it. After that, I just play the turn following the order token numbers as normal. This is a bit more chaotic way to play and makes setting up the combos harder (or luck dependent), but kind of evens out the planning as I cannot unconciously give advantage to one side or the other. I'm not playing for a specific side to win, but for the continuing story. To see where the campaign takes me, storywise. I just want to set up interesting maps and have a go for it. – I don't care the casualties the regular troops get, they are replenished By the next game (unless there is a story related reason to use the platoons understrength). _ I keep notes on the Heroes and Heroic platoons. When a hero dies, he is out from the campaign for good. When a Heroic platoon takes too much casualties, it is out of the game for good. – When a force loses every Hero associated to it, I deem the force has taken too many casualties and it is finished from the campaign. I.e. if every Deep One Hero is dead, no more Deep One attacks from the swamps. They are dead or gone from the area. – When a Hero with a white border option slot survives a scenario, He/She is promoted to the next level (levels go from 0 to 3). I roll a die and divide the result by 2. I then draw this many (1-3) white border or green border equipment/skills from a bag and the Hero gets to hoose to keep one of them. The Hero keeps that upgrade from game to game (and gets more upgrades as He/She goes up levels until has 3 upgrades) and the "earned" upgrades do not cost any points during the army building phase. For example, Ariane survived the last game, so she goes up to level 1 and got the charm skill upgrade for her level 1 reward. She now has the charm skill for free every time I put her in a game. When she survives another game, she goes up to level 2 and earns another skill/equipment and so on to level 3 also. So, some of the surviving Heroes get a bit stronger as the campaign progresses. The campaign scenarios will be invented as the campaign progresses and the story is revealed. So I will be improvising a lot with having only the "big picture" thought out beforehand: I have a rough map thought up and where all the various forces are, so I know which force to pit against which force. I have decided the opposing forces in other regions of the campaign maps similary. But only By playing the games I will know how everything proceeds. I have actually in mind that the real "end game" will be fought in the streets of Stalingrad. I will get there by a few magical Gates. The first one will lead to Irem in another dimension and a second gate will end up in russia, where the Germans will escape. This is a very good idea! I already tried randomising the Order Tokens, much like you, but it could sometimes be too random. I really like the swapping of the Bluff with an Order Token, because it balances the random Order picking. I used to play solo a lot too, also playing both sides to the best of my abilities. I'm gonna try your concept. I'm thinking of treating the Heroic order block the same way as Bluff order block, whoever has it, can exhange it with another order block. That way, if something absolutely has to go first, the Heroic order allows that (if your force has Access to Heroic orders). Anyway, I will keep playing this way to see if the order set up is too chaotic or if I can live with the randomness. Before this, I just placed the order tokens face up, just like in a regular game. It took lot of time as I was contemplating strategies for both sides. I also could not be very strategic as I was seeing both sides orders all the time. What's this new system you speak of, and where was it available? There's the Gazette with NCO rules… is there something else? Yes, the Gazette with the NCO's also comes with an optional morale system. It is the same optional Morale system that is in the Compendium. So if you have the Compendium you have it. You need the Gazette to get the Shaken/Routed tokens, though. And the NCOs are good to have too. Good points, but I just wanted to point out the system exists elsewhere. I agree, if there is room in the "advanced game" punchboards (new style aircraft and such), some Shaken/Routed tokens should be included to allow those, who doesn't have the gazette, to use ne advanced rules. After having played 2 games with the new morale system, I have to wonder if it was meant to be played in SoN at all? The SoN armies (Deep Ones and Cultists) do not have many officers, nor do they have access to NCOs. This might prove problematic going forward. Also the spellcasting would produce bunch of quivering sorcerers with no hope to gain orders after having cast spells. I already houseruled that suppression from spellcasting will be exempt from the morale rules. Summoned monsters? Would they have the SHAKEN/ROUTED status? I'm starting to think that a force with the "Mythos unit" ability should be immune to expanded morale rules. That might be easiest solution to this problem. Section M and Majestic factions will be subject to the morale rules as they can purchase the NCOs to boost their morale as usual. I'm still ruling that any Section M and Majestic sorcerers will be immune to SHAKEN/ROUTED status when casting spells. Altough there is propably enough command units around to keep the sorcerers in good shape. P.S. The Shoggoth is scary! The commandoes were totally unprepared to face it in my last game. I'm gonna play a "Monster hunters" scenario next with the Commandos preparing a bit better to fight the Shoggoth. That thing's gotta die! I finished the 3rd game – the Monster Hunters. I bought along 3 bazookas and Vickers with the commandos. Also got Section M Insiders, Ammo and Veteran abilities. Those all would give bonuses to my heavy weapon shooting or re-rolls. Packing up with these really made difference when going against the Shoggoth. It went down in the end! Funnily enough, it was Mad Jack Churchill, who actually killed the Shoggoth, with his Claymore! Granted, the Shoggoth was seriously wounded at the time (Vickers emptied all of the extra ammo with one go and the Bazookas took care of the rest). Mad Jack had, in the previous turn, decapitated a Reef Breaker with his sword, so he really was the MVP of the game! Two monsters downed with his sword. The Commandos suffered horrible losses (more than twice VPs lost at the games end), but since the objective was to kill the Shoggoth, they won the game, barely. 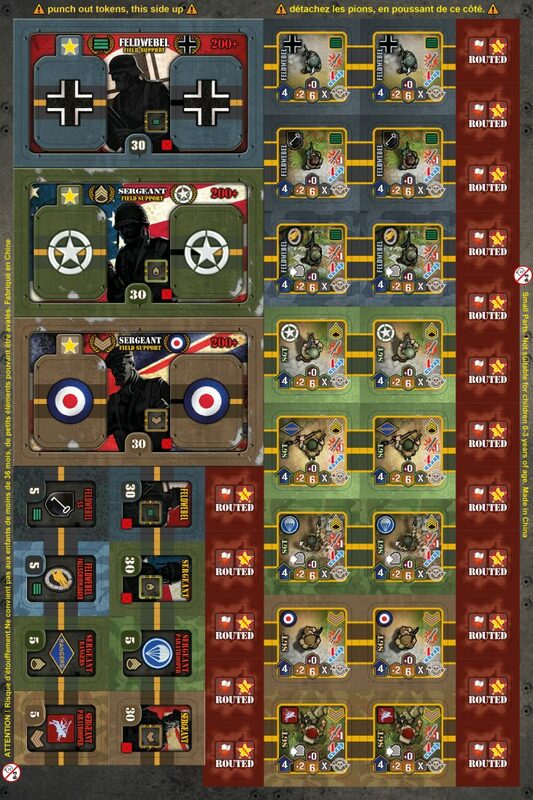 The new morale rules did not affect the outcome of this game as the Commando officers were well placed among the commandoes and prevented the SHAKEN/ROUTED markers placement. The Deep One side did not have to worry about SHAKEN/ROUTED because I had houseruled it that "Mythic units" do not get SHAKEN/ROUTED. There were several incidents of people getting madness markers though. Seeing the Shoggoth was really unnerving and it didn't help that the Cultist boss was constantly casting the spell that gave 2 suppressed markers to the target! I think I'm getting a hang on the new morale rules and how to make sure they don't affect the force too much (i.e. I'm keeping my officers spread out and close to my soldiers). I'm definetly going to keep using the morale rules from now on. Next game, I will be moving away from the Commandos/Deep Ones and move to see how the first paratrooper landings will proceed. This time it's the Red Devils against the "Wolfpack" (German force mixing the 21st Panzer, Anjas Wolfpack and Nachtwölfe support (represented By the Dust AXIS units)). This time both sides are fully affected by the morale rules, so I can see them in full effect in a game. I played another game in the campaign. This time it was an early Morning para drop (night rules) on map with lots of hills and woods. British Paras started with 300 points on the map and germans had 300 that arrived a random map edge. Objectives on all 6 map tiles, so the Paras were spread out. Random rolls for both dropping paras and german reinforcements arriving (1st turn on a roll of 6, second turn 5-6 and so on) It was actually the fourth turn that the first 300 points of paras dropped and turn after that the rest of 200 points dropped. Germans got their 300 points of reinforcements during the supply phase of 5th turn. The last germans (200 points) never arrived! But due to the random nature of the night drop, the Brits were scattered on all 6 map tiles while the germans arrived in good order. It was a german victory in the end because of the scattered forces of the Paras could not support each other well. Also, the Hans, a light walking tank, was a pure murder! (about half of the germans were from the Dust punchboards). I was surprised how good the Laser Grenadiers were. Anyway, the new morale system makes Paradrops harder as the troops scatter around the map and get suppressed tokens easily, which leades to SHAKEN troopers. It helped somewhat that I had bought 2 extra para sergeants that started the game on the ground. They were keeping the worst of the morale system from crippling the paras. Next game is a Glider landing one, so I expect the Paras to arrive more ordely fashion. Only problem is that it is still a night and Evil Anja is hunting the paras! In case I haven't made it clear already, I'm talking about the optional morale system in Gazette #6.